I cannot believe it's already been two months with Harrison: it's completely flew in, but at the same time, I can't remember a time before he was born. I can't remember a full nights sleep, or what it feels like to have clean jeans on, or what a hot meal tastes like, and to be honest, I don't mind at all. I'll apologise in advance for the length of this post - in the month since the last update, my little newborn is no longer newborn, he's changed entirely and he's already becoming a little character. I hate to say he's growing up too quickly, as anyone who's read my last updates will know that it's all I seem to say in them, but it really is true. I look at the pictures I took in the first few days, and he looks nothing like that anymore, he truly has changed completely and I can't even fathom the changes he'll make in the next few months. 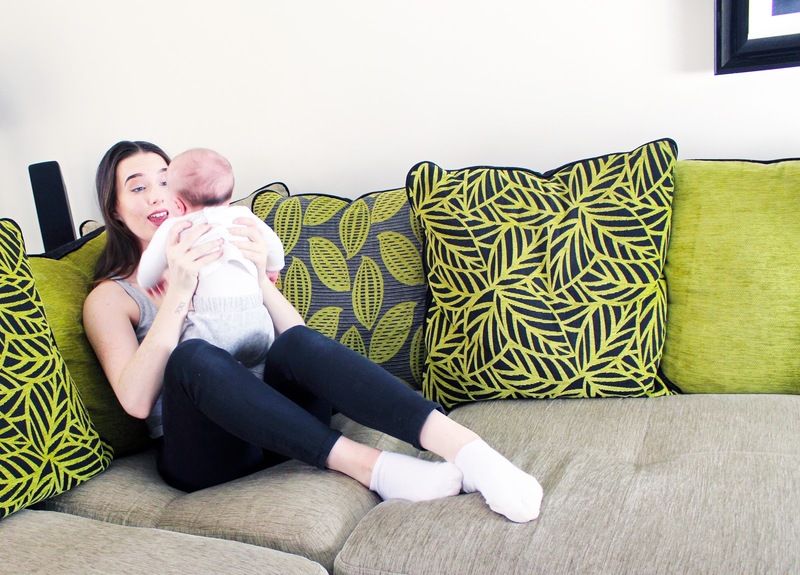 This last month has really been up and down, we went through a brilliant phase, and then the 8 week leap seemed to factor in a little early and all of the progress we had made with sleep seemed to disseminate very quickly. Then of course, sods law, just as we were getting over that, Harrison caught his first cold, and we took a dip yet again. This time though, I was able to cope with the lack of sleep a lot better than I have in previous months, I'm now at the stage where I can just get on with things, and that makes all the difference. In saying that though, in the last week or so, I was more emotional and erratic than ever, and now I can finally understand why they say the first period can be the worst. Now that I'm over that hump though, I can get back to moving onwards and upwards and enjoying my time with Harrison, rather than fussing over every little thing. According to the Health Visitor, he's ahead of the game - but I'm sure she says that to everyone. His reflexes are brilliant, and he is so engaged now, a complete 180' from our first month. He's also huge - on his last weigh in at 7 weeks old, he was 11lb 14oz, so I can only imagine what he is now, two weeks later. He's also 58cm long, so he is 75th percentile for both weight and height, and 90th for his head circumference - which was to be expected, big headed, just like his father. Other than that, there's not much worth mentioning. His skin has all cleared up pretty much, and we didn't have to switch his milk in the end. The only other issue we've had has been his cold, nothing more than the common cold, but in a little one it seems like so much more. He's been stuffy for days, and cannot breathe through his nose well, the build up in his sinuses has also meant he's been vomiting a lot as he is still trying to take his normal amount of milk, this is only been for the past two days though, and I'm pretty positive when he's better in the next day or two he'll go completely back to normal. His cold meant he didn't get his 8 week immunisations, so we'll have to get them next week instead, which I'm not looking forward to at all. What sleep? No, that's an exaggeration. Sleep is fine now - he goes down between 10 and 11pm, wakes between 3 and 4am for a feed like clockwork, and then we have a few issues going back down. Some days he'll sleep until 8am, others he's awake from 6am, but if I'm honest, right now, I have no complaints. I like my 5 hours at the start of the night, and that's more than enough at the moment. Sure, I'd love a baby that would sleep through the night from the get-go, but that's a rarity, and I'm ecstatic with my baby who is slowly but surely sleeping more and more. He's getting better at settling himself now as well, which makes it easier during the night, and hopefully in the next few months we'll get nap time a little bit more regular and then we'll be sorted. Feeding is without a doubt my little chunk's favourite activity. Harrison is taking 6oz every few hours now, and other than the last few days where he has been ill, he keeps it all down. I am still in the habit of getting him a 4oz bottle and expecting him to be ok on it, but he's never full on a bottle that size and since moving him up he's been a lot more content between feeds.We've now settled on the Aptamil milk, and the NUBY bottles, and haven't had any problems since. He smiles and laughs now. Proper giggles, and no more windy smiles. There's nothing better than making ridiculous faces and sounds and being rewarded with a cheeky little smile - if you'd told me this time last year I would be spending my Christmas Holidays singing Itsy-Bitsy Spider in a tone higher than I even thought I could reach, I'd have told you you were mental. Welcome to the big bath little man - he no longer fits in his baby bath, and so we've moved him into the big bath with the help of a baby seat. We'd wanted the angel care bath seat, but had been gifted a little Winnie The Pooh one from my cousin, and so far he absolutely loves it in that so I've not seen the need to invest. I cannot wait for him to start playing with his toys in the bath, at this point, he's more than content kicking his little legs, but the day the rubber ducks come out will be a fun day for us all. This entirely depends on the day I've had when you ask. Some days, Harrisons' been in a great mood, I've been productive, and I don't feel like a lazy slob, other days, when Harrison is in less of a happy mood, I can't help but focus on the fact that in my eyes, I've quite literally became a lazy slob. If I'm having a bad day, I don't leave the couch, and that does nothing for my self perception. I've struggled a lot with body image in the last month especially - for me, I no longer have the 'baby' excuse for being heavier than I was pre-pregnancy. That's ridiculous though, it has only been two months, and no one -bar myself- expects me to be back at the same weight I was before. For god sake I think it's safe to say I'll never hit 7 and a half stone again, and if I did I'd never be able to maintain it anyway, but I'd just love to feel remotely confident again. I hate my body, and the festive season is doing nothing for that. I hate to be that guy, but I'll start next week - Jordan is off work for 2 weeks from the 23rd, and I'll be using that time to throw myself back into the gym. I need to do something about it, I'm currently taking my frustrations out with my own self on every single person around me, and that's not fair on anyone. Other than my body image and confidence, I am doing well. I've managed to make it out of the house a lot more this month, most days in fact, and that has made all of the difference for my sanity. I understand what they say now about the 4th Trimester, it truly is so easy to get yourself into a bubble and stay there, going out is more effort than it's worth, but for the sake of my own mindset I need to make the effort. We're young, my pregnancy was unplanned and we've been thrown in the deep end. It was never going to be easy and I never expected it to be. Harrison is doing brilliantly, and we're coping well, it's an adjustment, but a baby always will be, and we were never going to have it mastered in two months. I've grown up more in the last two months than I have in the past 5 years, and I can only look forward to the next few months ahead. From here on out, Harrison has so many milestones to hit. I cannot wait for him to roll over, to sit up, to walk, to talk, and if this last 8 weeks are anything to go by, he'll be doing it all in no time at all.